Breakfast is the most important meal of the day, and what food is better for breakfast than an egg? You can do so many things with eggs – scramble them, fry them, boil them, use them in baking, make pancakes with them – the options are endless. But before you start your breakfast, you realize you bought your eggs over a week ago. Uh oh – how do you know if your eggs have gone bad? You may be wondering – do eggs go bad at all? It’s hard to tell when an egg has gone bad because they don’t show the signs of rot as other foods. 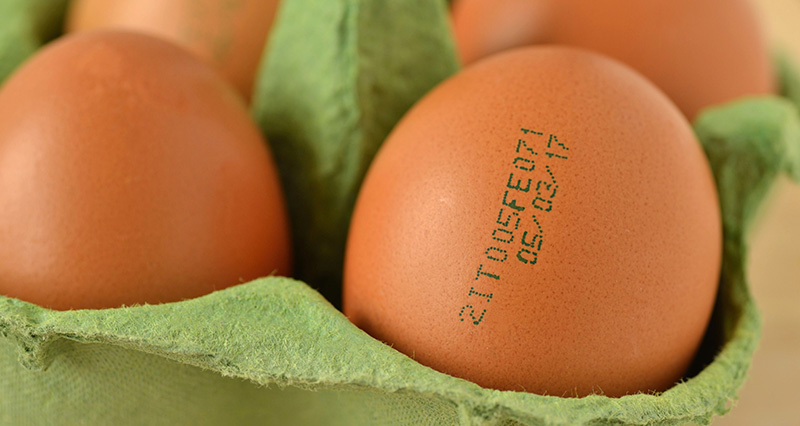 To make matters more confusing, the expiration date on your eggs isn’t always accurate. According to the Los Angeles Times, eggs are one food you are allowed to eat after the expiration date. Below we’ve provided some information on how to tell if eggs are good or bad. We’ve even included how to do a floating egg water test to help you determine if your eggs are still fresh. Here are some ways to check whether or not your eggs have gone bad. Before you start inspecting your eggs for rot, you can double check your calendar and remind yourself of when you bought the eggs. How long are eggs good for? Well, according to a test performed by What’s Cooking America, eggs stayed edible for up to 4-5 weeks past the marked “sell by” date. The test went on to show that most eggs were fine for as long as three weeks after a customer took the eggs home. 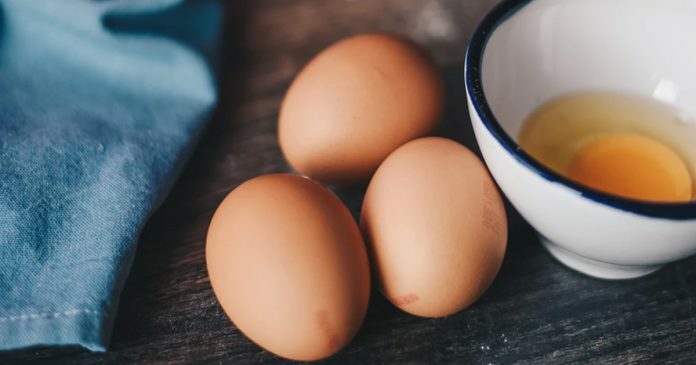 If you are still unsure about your eggs after checking the sell-by date, you can use some of the following methods to double check the freshness of your eggs. 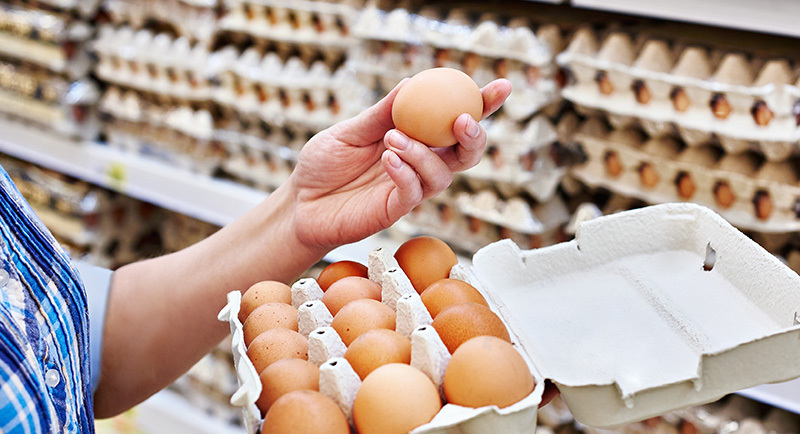 One of the easiest ways to know if your eggs are fresh is to do a visual inspection. Although eggs may not show the same obvious signs of mold as meat or vegetables, they do provide some evidence as to their health. According to Incredible Egg, any egg that does not look or feel smooth in your hand may not be good. Slime on your eggshell is a telltale sign that of excess bacteria developing in the egg. Egg whites contain sulfur, which is famously the source of their bad smell. According to the Minnesota Department of Health, sulfur can create slime. If an egg is slimy, it means the sulfur levels have increased and there are too many bacteria. These eggs are no longer safe to eat. According to The Poultry Site, eggs infected with fungus will display a green powdery coating. In some cases, this powder may be black and look like the egg has a beard. You definitely don’t want to eat this fungus! Toss out any eggs that may feel powdery, even if the color of the egg is normal. Once you have inspected the outside of your egg and determined it looks fine, you should crack the egg into a bowl. Inspect the egg whites carefully. If they appear to be pink or iridescent, they may contain bacteria. According to the United States Department of Agriculture, pink or iridescent egg whites are a sign of Pseudomonas bacteria, which can be harmful to humans. The Incredible Egg tells us that Pseudomonas can also cause the egg to turn blue or green. These eggs will have a sour or fruity taste. Pseudomonas bacteria tends to grow at temperatures above refrigeration levels, but below normal room temperature, so you can help avoid it by properly refrigerating your eggs. Another great way to know if your eggs are good is to do a sniff test. This is an old-school, simple method, used for centuries. Start by sniffing the egg while it’s still in the shell. If you don’t discern a smell but know your eggs are fairly old, crack the egg into a bowl and give it another sniff. If you smell anything off at all, toss the egg in the trash and wash the bowl thoroughly. 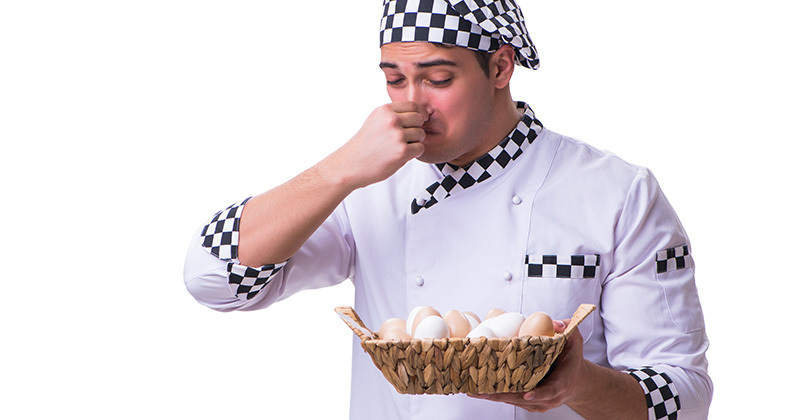 According to the Los Angeles Times, the bad smell in an egg typically comes from sulfur. There are traces of iron in the egg yolk, and traces of sulfur in the egg white. Over time, as the egg ages, the sulfur and iron may end up mingling, causing a chemical reaction. The result is a bad, rotten smell. According to Men’s Health expert Alan Aragon, the expiration date on an egg carton is not always reliable. If you always throw your eggs away immediately on the expiration date, it is likely you will be wasting a lot of money and a lot of eggs. The best way to check if your eggs are bad is to do an egg float test. To perform the egg float test, put an unopened egg into a bowl fresh, cold water. Watch carefully to see if the egg floats. If the egg sits at the bottom of the bowl, then it is fine to eat. If the egg floats, it means there is an excess of bacteria in the egg, and it is not safe to eat. Throw out any egg that fails the float test. Bad eggs float because the bacteria present in the egg creates a high level of gas. After a chicken lays an egg, the egg begins to cool. The cooling process causes air cells to form. As the egg grows older, the air cells grow larger. As the air cell grows, more gas and bacteria flow throughout the egg. An egg is rotten when so much gas is present that it floats. The float test can also help you determine the age of your eggs. Eggs don’t just float or sink during the egg test. An older egg, placed in a bowl of fresh, cold water, may turn upside down so that the wider base of the egg is floating on top. The upside down floating is a sign that your egg is old but still edible. A fresh, new egg will stay right at the bottom of the bowl. According to an article published by the University of Florida, candling your eggs can be a fool proof method to determine their health. The process of candling an egg used to be done with a candle, which is where it got its name. Nowadays it is done with more modern sources of light to expedite the process and determine the health of an egg. Candling eggs is done on an industrial scale when farm workers put eggs in cartons to sell in grocery stores. Farmers and agricultural companies use large-scale industrial equipment to candle their eggs, but it is very easy for you to do it at home using regular, everyday materials. To candle your egg, you will need a dark room or space in your home. Grab a flashlight (although you are welcome to go old-school and use a candle) and point it at the egg. Hold the egg up in the light and quickly tilt it back and forth. As the light points at the egg, it should illuminate the egg’s interior so you can see what’s going on inside. Your goal is to determine the size of the egg’s air cell. As we discussed above, a healthy egg will have a smaller air cell, probably around an eighth of an inch. If you notice the air cell is larger than an eighth of an inch, or about 3.175mm, it may be time to throw out the egg. While candling, you can also check out the movement of the egg’s interior. As the egg moves side to side the egg white and the yolk will move too. Slower moving egg white and yolk means the egg is younger and fresher. If the egg white and yolk are moving quickly or seem thin to you, that means your egg is older. Consider tossing these eggs in the trash. Sometimes you may notice something going on with your egg and conclude that it is a bad egg. But not all discrepancies between eggs is a sign that they are bad. Here are some things you may notice about your eggs that are actually perfectly safe. Keep these in mind, so you don’t waste money or food throwing away a good egg. Sometimes there may be a blood or meat spots on the surface of your egg. These pop up when a blood vessel on the egg yolk’s surface has ruptured. Usually, an egg with a blood spot will not even make it to the market. If you happen to get an egg with a blood spot, go ahead and eat it! These are safe to eat on both a chemical and nutritional level. You may notice twisted or ropey strands in your eggs. These are officially called chalazae, and their purpose is to secure the yolk in the center of the egg white. The chalazae are essential to the egg’s development and are a sign of a young, fresh egg. Chalazae should not effect the way your egg cooks, so go ahead and scramble it up for breakfast. At the end of the day, you do not want to eat a bad egg, but you also don’t want to throw out a healthy one. Use these methods, or even a combination of several methods, to check the health of your eggs before eating them and before tossing them out. We hope you enjoy your breakfast!